Cultivate Search Engine Positioning, Inc. is the Search Engine Consultancy business of Mike Farley. With 10 years experience in website creation and optimization business I offer consultation on Search Engine Marketing and Optimization to small businesses and corporations throughout the U.S. Whether it's PPC or Search Engine Marketing I have the expertise to drive the highest ROI (Return on Investment) your site can attain. I've effectively increased quality traffic to my client's websites up to an astonishing 8000%! Don't waste time and energy with SEO firms 'Project Managers'! 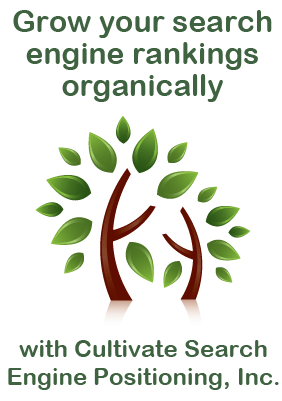 With Cultivate Search Engine Positioning, Inc. you get personal 1-on-1 service. No tracking down programmers or marketers, get the personal service your website deserves. What is a Search Engine Optimization Consultant? By now I'm sure you've researched SEO and the various companies that offer SEO services. So how does an SEO consultant fit into the picture? While an SEO firm handles everything from link building, on-page optimization, etc. and keeps everything in-house an SEO consultant reviews your website and your competitors, gives suggestions and a road map for how to get your success. You can then take that to an independant programmer or design company to execute your new roadmap. To be honest it all comes down to dollars and cents. It's much more cost effective to have someone like myself audity your website and competition then provide you with the feedback you need without committing to $10,000, $20,000, or even $30,000 dollars a month which many SEO firms require. Get the information you require without breaking the bank. Of course if you are happy with the service I provide, we do have in-house optimization packages which will allow us to take the data we've found and make the changes necessary to get your ranking today! With over 10 years experience chances are if you're expeirencing traffic or ranking issues I've seen it before and know the solution. WIth my website audit service I will personally analyze the problem, examine your website for red flags or other major issues, and provide you with the solutions you need. I offer two audit services: a standard website audit and a premium website audit. Click below and read more about my audit services as well as a comparison chart of standard and premium audits. While there are hundreds of niches out there that have little online competition, most small businesses are not so lucky. It takes a steady SEO strategy to get you and keep you at the top of the search results. I have assemled a fantastic team, each specialized in a segment of SEO and we are ready to launch and manage your search marketing strategy. Whether it's strictly SEO, or a blended combination of SEO, PPC, and Social Media we are ready to take your business to the top. PPC or Pay-Per-Click advertising is simply paying a fee per click for placing at the top of a search engines sponsored results. Think of it as "Pay to Play"
This fee can be anywhere from 10 cents to $40 or more depending upon the competitiveness of the keyword or keyword phrase. With Cultivate Search Engine Positioning, Inc.'s PPC Management Service you get the best possible results with the smallest cost per click maximizing your Return on Investment. Local Search results are geographically tied to a location. So a search for Chicago Pizzarias for example will bring up a listing at the top of a search page that lists local pizzarias in Chicago. Local Search is quickly becoming a major factor in an effective Search Engine Maketing strategy ever since Google went from 4 local results at the top of the search results page to 10! Learn what it takes to get to the top and let us get the Search Engine Positioning you deserve. CultivateSEO.com - Now with 100% more search training!